*Sigh* Stillsuits covered the head. Back in days gone by when I was a kid in school one of the annual events which I loved was book day. It wasn't just one day, actually it was two. The day that the catalogs came and the day that the books came. Those were great memories. The days of the Troll and Arrow books clubs with our Weekly Reader supplemental materials. These were events that stopped class - always a special occasion! On catalog day we received our hallowed missives. Bright and vibrant full-color leaflets of about 5 to 8 pages. The books offered had a wide range. 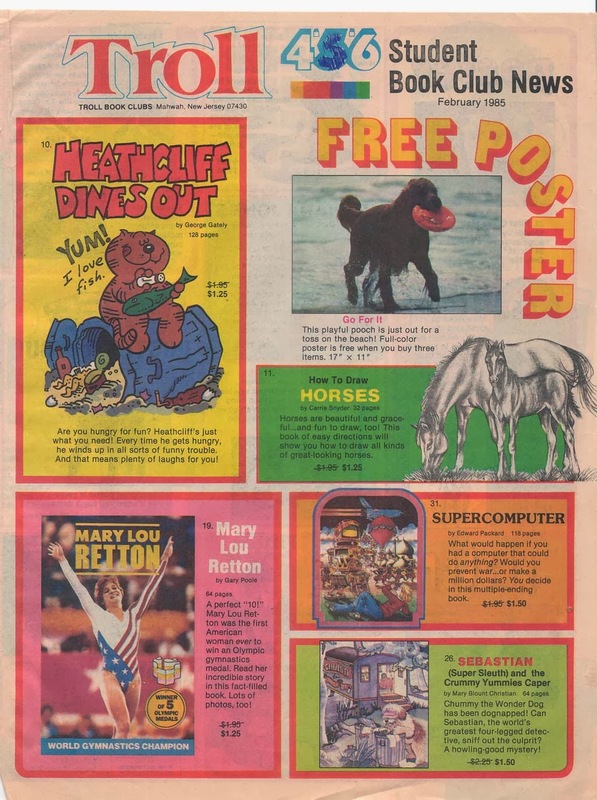 There were the cheesy 'cool' educational gems chocked full of mental nutrition. 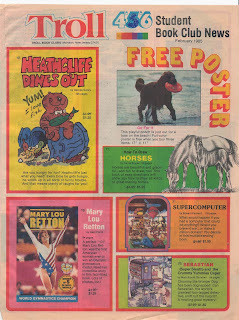 There were the actual mainstream children and teen books. There were the stereotypical girls and boys books. 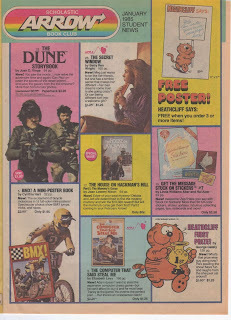 And finally there were the 'which-way books' - I lived for those. Now back then I wasn't the reader that I am today. Oh, I had times when I would read quite a bit, but I wasn't 'a reader'. I would more often have my nose in my Dad's old encyclopedias than reading something like an actual novel. My peers of the day were much like me. The girls of the class were more like to be the deep readers. We boys were the dabblers. However, book day was event that crossed all borders and got us guys interested. I can speak from actual experience here. Everybody in the class usually ordered something. That event was in the Fall. It was one of the early class bonding activities. Then the year would drag on. Winter would bestow its blessing of snow days. Tests, quizzes, exams, book reports, oral presentations, poem memorization all would serve to cloud the memory of catalog day. Then with the coming of the Spring amidst its bounty of flora and fauna the boxes were delivered. That was always a magical day! Almost every year I would have completely forgotten what I ordered. Names were called and happy students walked back to their desks with their treasured stacks. Those days are among my happiest school memories. I feel that those book club days really ingrained in me an appreciation of the book as an object of happiness. As I stated earlier, I wasn't really a reader. I wasn't really buying books to read, but books to enjoy. 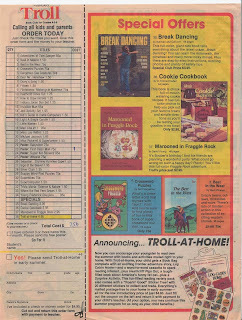 I am fairly certain that all these companies either were a part of or have been acquired by Scholastic. I did a little delving to see when these programs started but it seems to have been one of those slow morphs over the past century or so. 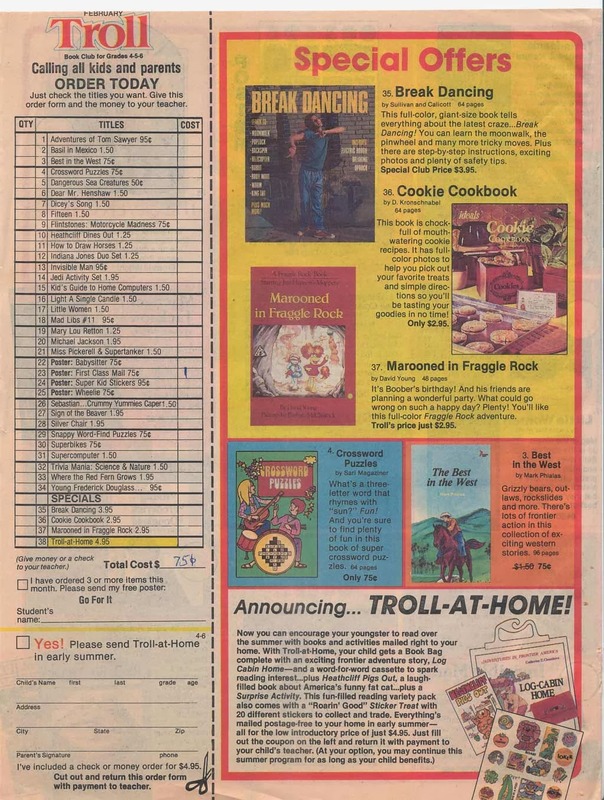 I did stumble upon the Scholastic timeline which is pretty cool. Please note, the year of this catalog is 1985. In 1985 I was in 7th / 8th grade. So these catalogs would have been distributed to the little brats two grades behind me.